We are passionate about solving HR challenges. Let’s talk today about your HR emergency! 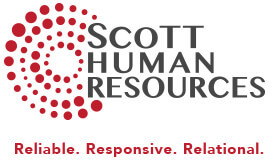 Scott Human Resources provides professional and reliable solutions to HR challenges to businesses like yours as a full-time partner or as a consultant as needed. Managing employee benefits, hiring new workers and motivating your managers to succeed takes precious time away from running your business. Scott HR provides the professional services you need to benefit your business. As a large company with in-house human resource staff, your time is valuable. Daily HR tasks and urgent staff needs can have your team focused on putting out fires instead of preventing them. Outsource those tasks which drain time and energy! With larger organizations, Scott HR partners on a variety of special projects: Job Descriptions, Employee Handbooks, Wage Bands, Performance Appraisal Systems, Hiring/Firing and much more. Having a trusted human resource partner in Scott HR provides assistance and guidance while creating the opportunity to introduce new initiatives and goals. Situations that involve a suspicion of wrong-doing or improper activity often call for an investigation. Outsourcing investigations to an impartial individual like Scott HR, reduces the perception of unfair treatment and allows business to continue as normally as possible. We can also improve conflict resolution by acting as an unbiased facilitator. For most business owners, benefit administration is a dreaded and time-consuming task. You can stay focused on organization profitability by outsourcing this chore. We can analyze benefit programs and ensure proper implementation of enrollment and changes. Invest in your people and management programs by reviewing human resource policies and practices. Just like any area of business, HR requires updates and adjustments to remain effective, productive and legally compliant. Problems in other areas of the business often start with a human resource need that goes unaddressed. A human resource audit sets benchmarks for where you are today and creates strategic plans for where you want to be tomorrow. Guide your team to successful project completion. Scott Human Resources works with owners and management teams to identify priorities, set goal deadlines for implementation or completion of projects. We can all think of a project that has been pushed to the back burner time and time again. A project that would positively impact your business, but continues to get overlooked because of other pressing issues. This is where an accountability partner can be invaluable. Let Scott HR partner with you to set realistic goals and benchmark progress toward the goal. For team goals, a visual tracking system can be very persuasive. Ask about goal incentive programs and creative goal boards. What is Partial HR Outsourcing? When you partner with Scott Human Resources on specific projects, you’ll find you have more time for the work that matters most. Outsource HR tasks that drain your time and energy! What is Total HR Outsourcing? Many growing businesses don’t need a full time Human Resource Manager, but they do need an HR expert on call. From legal compliance to performance coaching, managing HR shouldn’t distract you from running your business. Scott Human Resources values long-lasting partnerships and wants each of our clients to succeed!